Way back in 1983-ish, when BACK TO THE FUTURE was gearing up to go into production, Michael J. Fox was the unanimous choice for Marty McFly. 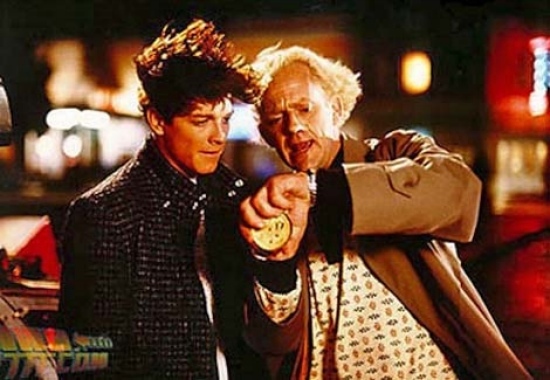 Unfortunately, producer Gary David Goldberg refused to let Fox have time off from filming FAMILY TIES so director Robert Zemeckis and producer Steven Spielberg went with their second choice, Eric Stolz. They filmed for nearly five weeks with Stolz before looking over the footage and realizing he was completely wrong for the part. Zemeckis said Stolz turned in a first rate dramatic performance, but they weren't getting any of the laughs they intended when he and Bob Gale were writing the script and it was turning into a much, much darker film than they had intended. Facing that, they let Stolz go and did whatever they had to do to get Fox. It added another 3 million dollars to the budget (which was actually about 1/5 of the total budget for the movie) and had to start all over. The studio has been reluctant to ever let that footage out, but they decided to include the footage and the story on the 'making of' feature that's included on the 25th Anniversary DVD's hitting stores later this month. I grew up with these movies and they were as big of a part of my childhood as STAR WARS and INDIANA JONES, so it's a little jarring to see scenes I know so well looking completely different 25 years later. But it's always fun to think about what might have been.